Taste is the sensation produced when a substance in the mouth reacts chemically with taste receptor cells located on taste buds. The tongue is covered with thousands of small bumps called papillae, which are visible to the naked eye. Within each papilla are hundreds of taste buds. 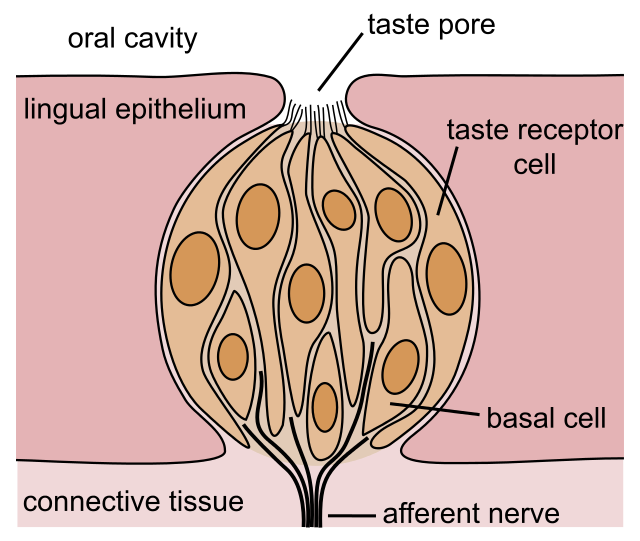 The exception to this is the filiform papillae that do not contain taste buds. One of the sensations produced by the tongue in response to certain chemicals (Wikipedia). (countable and uncountable) A person's implicit set of preferences, especially esthetic, though also culinary, sartorial, etc. (Wikipedia). NU (figuratively) A small amount of experience with something that gives a sense of its quality as a whole. VT To sample the flavor of something orally. VI To have a taste; to excite a particular sensation by which flavour is distinguished. OBS To try by the touch; to handle. The taste was of sweetened silt and arabica beans that hadn't been gently roasted so much as charred to death in their very own auto-da-fé. My musical tastes don't run to Wagner, I'm afraid. That color scheme really oversteps the bounds of good taste. No one to look at her preparations, and admire her deft-handedness and taste! Meaning of taste for the defined word. Grammatically, this word "taste" is a noun, more specifically, a countable noun and a singularia tantum. It's also a verb, more specifically, an intransitive verb and a transitive verb.